Fancy a skin ‘trainer’ and mind guru from Nourish Skincare ? If you follow me on social media or subscribe to my website you probably know that I work with Nourish skincare ( I am part of a team that is an exclusive distributor of this natural British brand in Russia and I believe in full disclosure when it comes to writing about products or brands on my website, so you know the full picture ). Having started using Nourish products pretty much since the official launch of the brand, I continue to do so as a consumer – in part because I like the products and because they work for my skin, in part because it is a necessary and pleasant part of my job, after all if I don’t try the products myself ( or have feedback from my testers ) how can I recommend it to you or write about it ? Part of any beauty brand’s success in a very tightly saturated marketplace is the ability to never rest on its laurels and to respond to customer feedback and requests. Nourish used to have wonderful body butters for four different skin types ( Relax, Protect, Balance, Radiance ) but some of the customers found their packaging ( large glass jars with screw-on lids ) quite bulky. 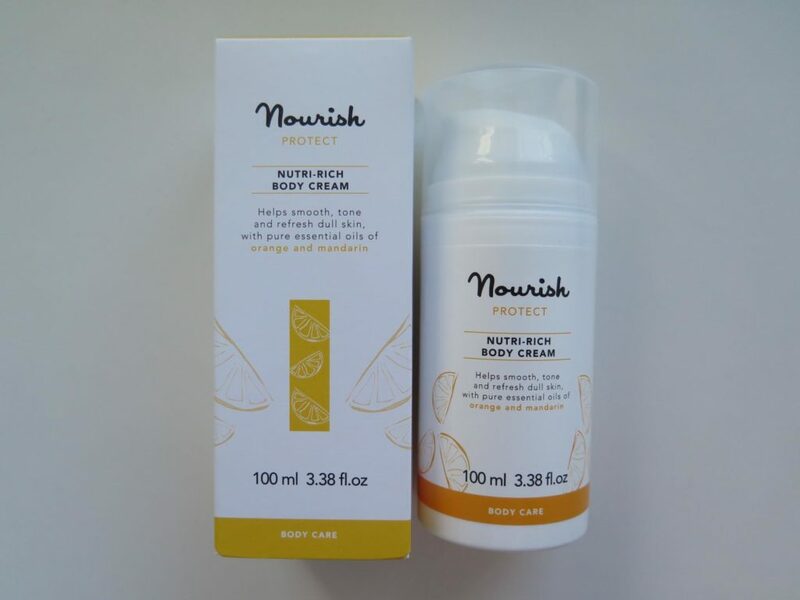 Pauline Hili, Nourish founder, always says that a customer is always at the forefront of her mind, hence the brand recently re-launched the body care products in the new, light, 100 mls airless pumps. You can still make your choice based on four skin types, your skin’s needs in the moment in time and depending on your sensory preference. The product is now called ‘Nutri-Rich Body Cream‘ and comes as a convenient 100mls bottle which you can easily put on a shelf of your bathroom, throw it in your gym bag or in your suitcase without the worry that it will spill. When you skincare comes in the jars with screw-on lids exposure to air can affect the efficacy and smell of the product so the new packaging puts this issue to rest as well. I have been using two of Nourish Body creams in the last month: Protect in the morning or after the shower, post workout, as its uplifting citrus scent gives me a mental boost, while photo-active marine align and hyaluronic acid and peptides work on toning and smoothing my skin ( I call it nourishing my body with exercise and skincare, both inside and out ). In the evening, when I unwind and try to de-clutter my mind, Relax Body cream helps to sooth my tired limbs and soften the skin with Omega-rich borage and argan oils, while the natural scent of lavender helps to put me in a relaxed state of mind. One product acting as skin ‘trainer’ and mind guru is not bad, is it?